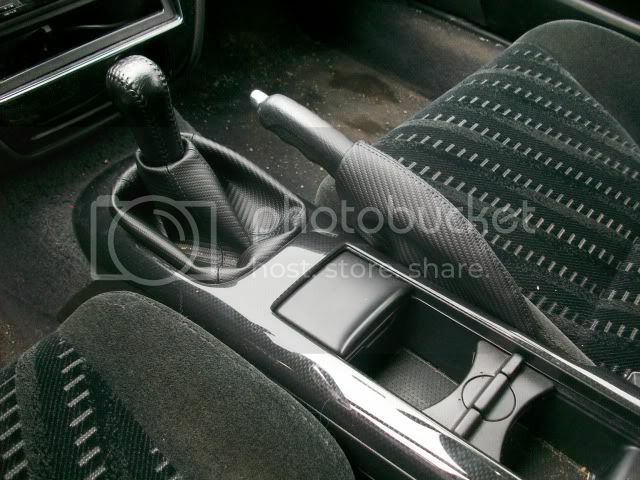 Post up pics of your pedals...and if you have a nice shift knob (matching or not) throw a pic of it up too! 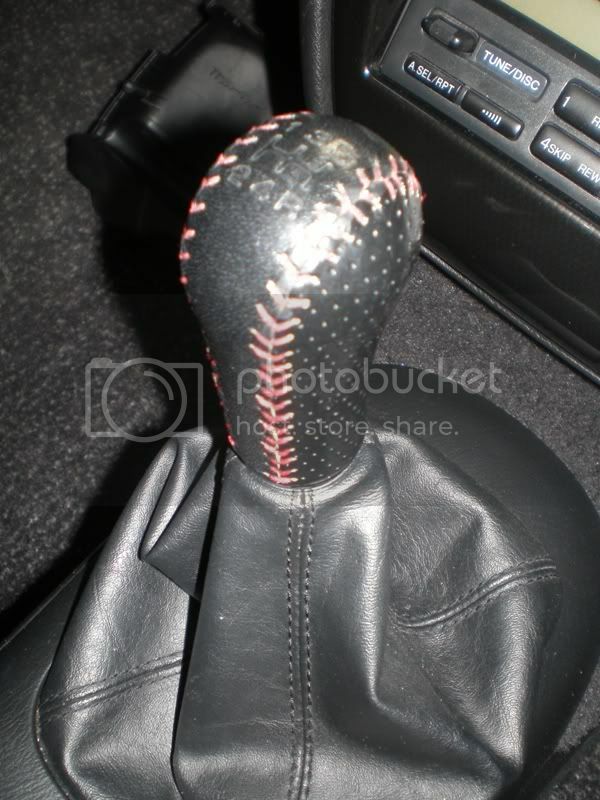 Re: Official Pedal/Shift knob thread! So your wanting pictures of peoples knobs? I really liek the voodoo knob I have for my s2000 its a big heavy ball and countersunk too. 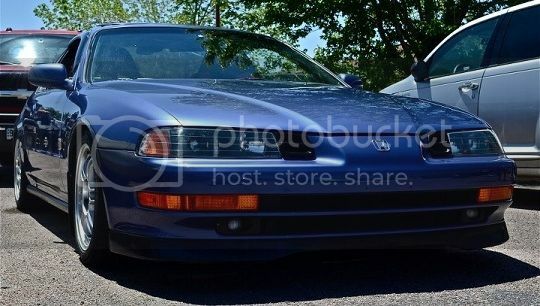 The shift boot for the 4th gen prelude though is different. its got some kinda clip holding it up to the oem "knob"
So If I took that out and put a nicer counter sunk knob in there for example. I dont know if I'd just end up losing the boot or what? The overall idea was to order that JTC short shifter... and a new knob, but I'm ont willing to not have a boot. 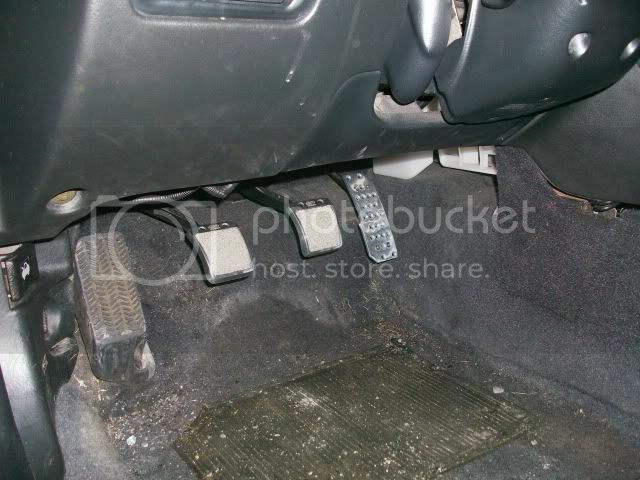 So do I buy a new shift boot or is the OEM one adaptable some how to an aftermarket knob? as far as pedals are concerned the mugen ones are on ebay for $40 incl shipping. I highly doubt they're authentic but I read a thread or two on honda-tech and they said they're as close to the real thing as you can get... which is good enough for me. ANND because I bitched about pics here ya go! Last edited by Lazer; 12-17-2009 at 05:14 PM. 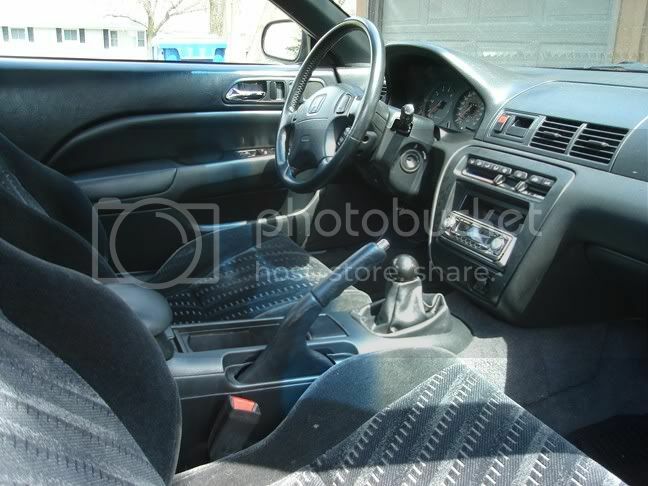 So you guys with aftermarket shift knobs can you help me figure out what I need to buy in terms of a boot that will actually stay up, next to the knob despite there being no ring? I bought a fake type r shift knob off ebay and zip tied the inside of the stock boot to the shifter. basically you fold the top down and zip tie it on the inside to the shifter. 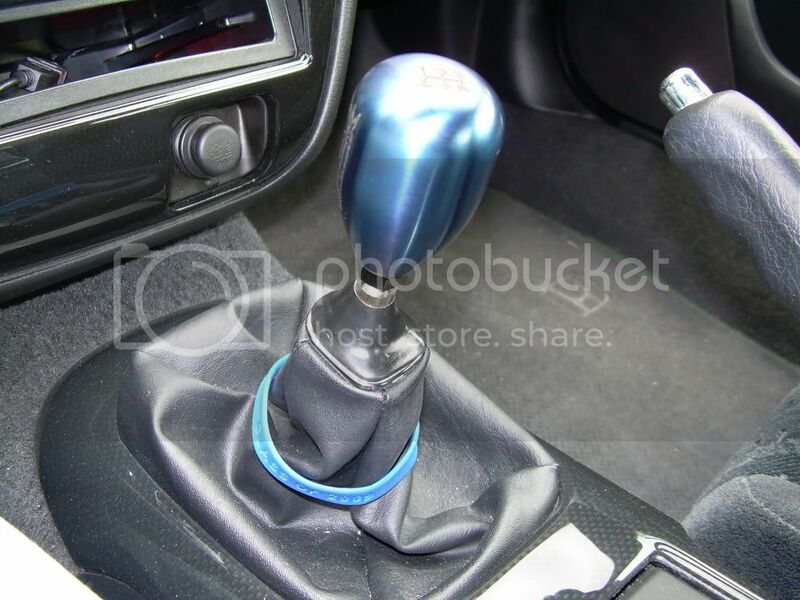 Here's my Blox torch blue shift knob. Weighted too. The rest of the day it just looks blue. This is without the flash. And about the boot, is like Lazer and 98baselude said, fold it and zip tie it. I'm rocking the JTC short shifter and it helps with the zip tie, before the SS the boot will slide down over time, but now it stays in place perfectly thanks to the design. Look at the SS comparison photos in the thread that lilbluelude made and you will understand what I mean. 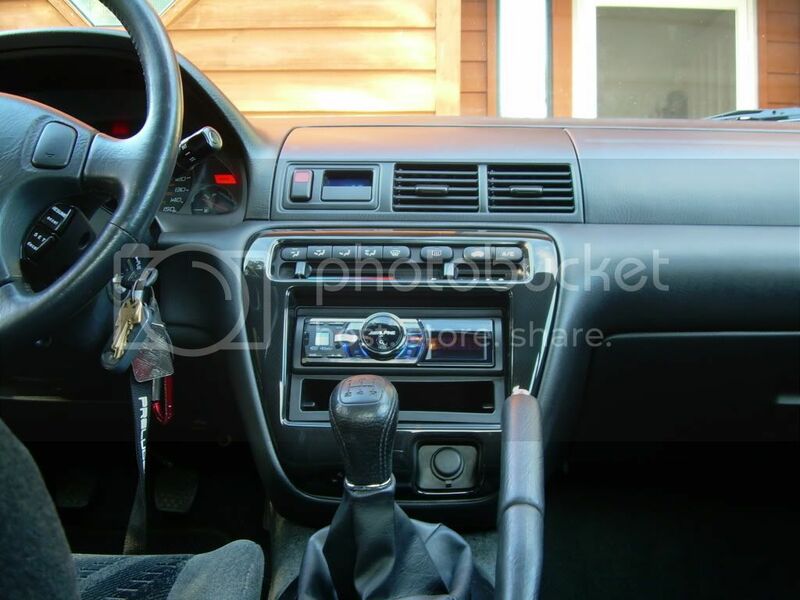 On the prelude I put a ctr shift boot on with my arc titanium knob and they sat perfect with each other. I am still using the knob on the s2k. Starbai I'm thinking about getting that 2" diameter one that weighs over a pound that is countersunk that pops up on s2ki sometimes for $49.99 looks great and is pretty functional. I'll post pics of my current knob tomorrow. Thanks for all the positive comments about the shifter here..
BTW.. Ive got some knobs designed up. Might be producing some soon if I can get some 'funding' . lol I have the same head unit Lazer. I would like to find some nice blue pedals. I'm at work right now so I can't take a pic of my knob but here is one I found. 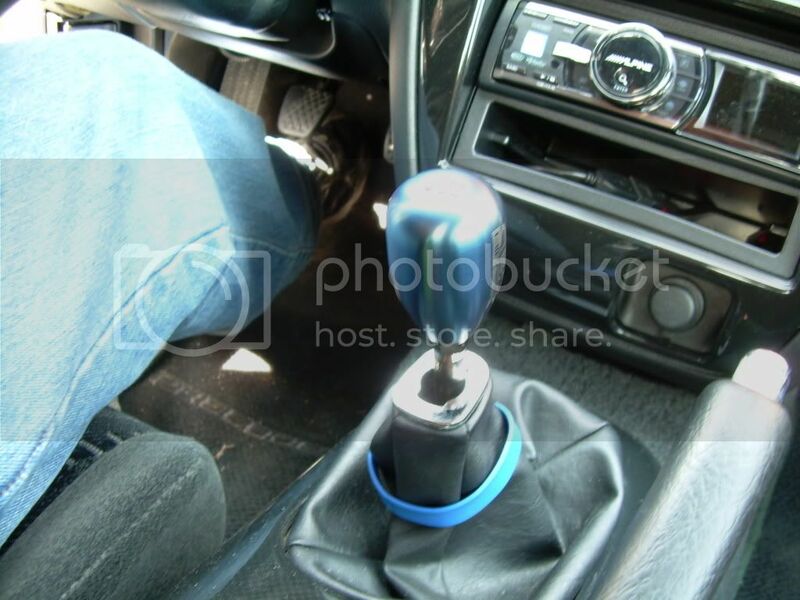 It is the blue JDM Type-R.
in my opinion the mugen shift knobs are badass i am getting a silver one for my car, but as far as the shift boot stayin up? its simple man, take off the boot and put a tiny washer at the desired height you want the boot to stay at. eh now that I have an aftermarket knob I can *knowledgably* post up in here lol. 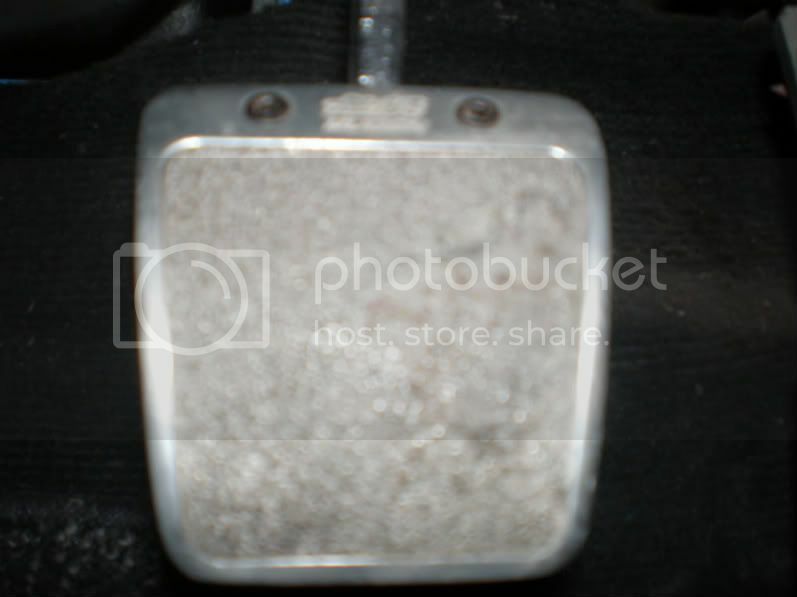 IMO, a simple washer won't do the trick fro the stock boot. It will keep it up, yes, but it will clink around the shaft VERY annoyingly. not only that but the boot will hold itself up as it is, just a small bit below the shiftknob. Solution you ask? Again, more picture evidence! I wanted to buy one but they only sell to the u.s.